Emerald mines is your collection of "Emerald Mines" games. Since then, the game inspired people from all over the world to design new levels and create countless spin-offs and clones. The main purpose of this site is to archive all released Emerald Mines disks for the Amiga. However, this site also stores other Boulderdash Clones for the Amiga, and maybe in the future for other platforms as well. If you want to play these games, go get yourself an Amiga, or - more probable - use an emulator. 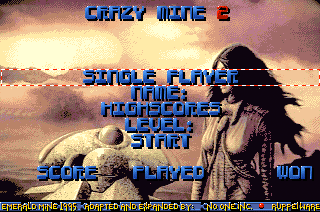 Sandancer (Bryan Waters) dug out the long lost "Crazy Mines 02" from his physical disk archive. One minor note: It doesn't contain new levels as it is a repack of Crazy Mines 01 to a new version of the Emerald Player. Oh well, at least it's one more mine that we can strike off our "missing" list. Amiga Mine 6 - 11 on some lists called "AGA mine"
If you have any Emerald Mine games / levels / clones that are not included in the archive, and you wish to contribute, please contact us. Of course you can also design some caves yourself!